Let RIR guide you on a walk around the sacred, pre-Olympic corners of the resort town. 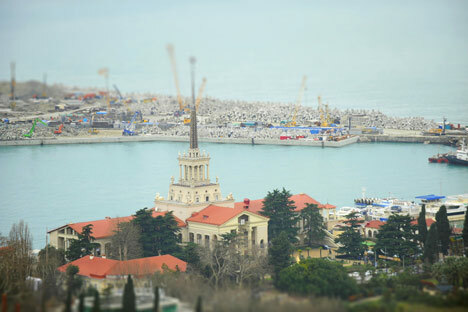 Sochi has been changing at an amazing pace — especially over the last few years, with the entire city being turned into an enormous Olympic construction site. RBTH invites readers to take a walk around the sacred, pre-Olympic corners of Sochi. You have to resist temptation, because the best thing you can do after landing is have a good breakfast. A few minutes’ ride from the airport is the local trout farm, located on the picturesque bank of the river Mzymta. They have cultivated rainbow trout here since the time of Nikita Khrushchev. Take a leisurely walk past the long ponds there. While you work up an appetite, the local cooks will do their job. Don’t think a juicy piece of trout grilled in foil is your ideal breakfast? What about a healthy portion of “balyk” (cold, smoked fish or meat) sprinkled with lemon juice or lightly salted caviar? The best way to get to Big Sochi from Adler is by Aeroexpress train: you can avoid any traffic jams and catch a glimpse of the sheer scale of the changes taking place in the city. Once the fare is paid ($6.50), the train will take you faster than the wind. If you have made up your mind to travel back in time, you should stay at a classic Soviet hotel. There are few of them left in Sochi. The Primorskaya stands in the city center, next to the art museum and the promenade along the seashore — a perfect place to take a walk at night. The hotel was built in 1936 and, as a monument of architecture, serves as a fine example of Southern Constructivism. The first few floors overlook a magnificent park with palm trees, magnolias, oleanders and cedars. A studio offering a breathtaking sunset panorama will cost you $181 a night, whereas a regular double is available at $129. Get ready not only for very dark but also very early nights in Sochi. It’s almost as though someone turns the lights off on the region. At night, the Winter Theatre — the local citadel of culture that remembers prominent singers such as Kachalov and Lemeshev — welcomes those who seek cultural entertainment. The imposing building is surrounded by Corinthian pillars and crowned with statues of muses, which all contribute to the perfect imperial style. The leading Russian theatres perform in Sochi between their regular seasons, but even the local Rachmaninoff String Quartet will delight you. Concert fees run from between $10 and $22. Try the restaurant Cascade for breakfast: the establishment has even been described in one of the poems by Nobel Prize winner and poet Joseph Brodsky. To get to the restaurant, walk to Kurortny Avenue and then continue down the street for a few minutes. Café Alyonka flanks the restaurant, serving the most delicious, freshest cakes in town. Anyone visiting Sochi will eventually find their way to Riviera Park. Children cluster around the rides, and their parents either take long walks along “writers’ alley” or drink unbelievably strong Turkish coffee in one of many cafés nearby. You can find shelter from the icy, winter wind (Sochi dwellers call it “bora”) at the seaquarium, where you can see the Black Sea shark or a flatfish that looks like a deflated football. You can even feed the ever-hungry piranha without running the risk of having your fingers snapped. Those who are a bit older would definitely enjoy a visit to the small magnolia grove, where trees were planted back in the 1980s by cosmonauts and high-ranking party officials. The Tsentralny Market is the perfect place to buy souvenirs. Tourists return from Sochi with suitcases filled with brownish-reddish, jointed, “churchkhela” nuts in grape-juice jelly, extra-sweet, dried persimmon and Caucasian spices (“Svan salt” and “utskho suneli”). Sun-dried horse mackerel should be wrapped in a piece of paper before being packed, while chic brooms made of eucalyptus leaves for use in the sauna can be carried unwrapped: your fellow travelers will not complain about the smell. Of course there are also feijoa (Sochi is probably the only place in Russia where this Brazilian berry grows in the wild) and Abkhazian tangerines, with their inimitable flavor. Small pieces of fashion jewelry, cameos and rings produced by local craftsmen are best bought at the Art Salon on 29 Kurortny Avenue. You can also acquire picaresque paintings at the local arboretum. It would be a crime to travel South and not dine at the seaside. The restaurant outside the Sea Port water zone is called “Prichal” (Pier) No.1. It serves burrata cheese with ripe Baku tomatoes, olive oil and freshly ground black pepper, moules Marinier, honey-glazed black codfish fillet with green asparagus and goatfish à la Provence with seafood. The average bill is $97. Now it is time to be getting back. You know the drill: the railway station, then the Aeroexpress train, then the airport. You return from the Stalin-era paradise as a demigod, with a branch of magnolia in your hand and sunshine in your eyes. Take one last good look at the city from the plane, for it will not be the same next time you return.